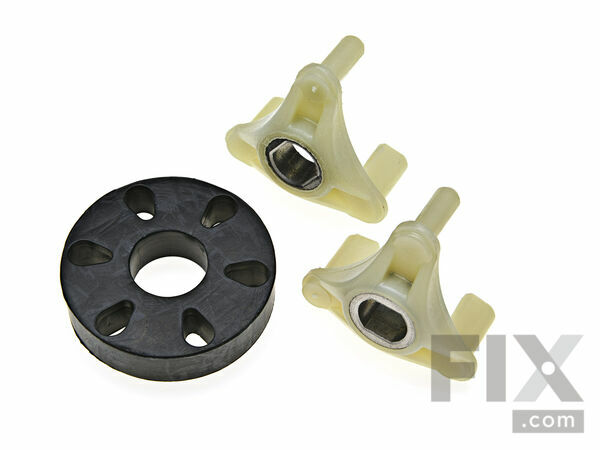 This coupling kit is located between the motor and the transmission on direct drive washers with no belt. This is the newer version and is made with new metal sleeves for added strength. Part Number 285753A replaces: 1195967, 21003, 280152, 285140, 285743, 285753, 285753A, 285753A, 285753AVP, 3352470, 3363664, 3364002, 3364003, 62672, 62693, 661560, 80008, 8559748, AP3963893. First, I found it very easy to follow the help on your web site to determine the most likely parts that would cause my problems. The direct drive motor coupling could be the cause of both problems. 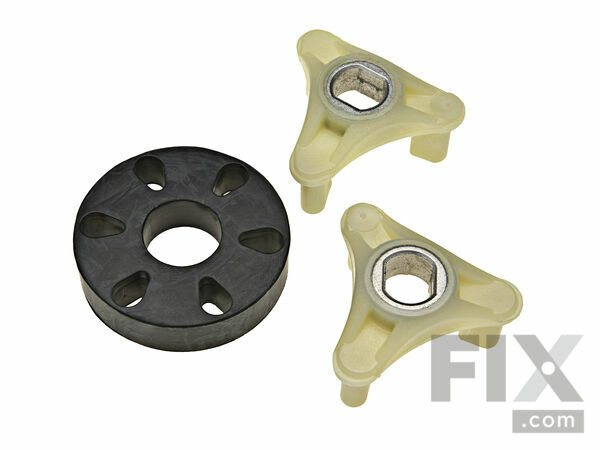 Also the agitator repair kit was the most likely cause of the agitator problem, So, I ordered both parts. When AI received the parts there were videos included instructing every detail for installation. I just followed the video for the direct drive motor coupling and both problems were solved with the one part. It took about 30 minutes and was a simple installation. .Thanks for your good service. It saved me a service call or maybe a new washer and dryer set. My washer was making a loud rhythmic click/thunk sound during the agitation cycle only, everything else functioned normally. I disconnected all electric/water hookups and took the washer to a more open area. I tipped it over so it was laying on the back, this way the motor was oriented "upwards" from the central agitator and the motor's weight would be supported during work. Before I took everything out I was able to see the drive coupling from the side and slowly rotate it, and it was obviously broken into two pieces. First I removed the metal clasps holding the plastic reservoir against the motor; they were not screwed in so they simply had to be snapped off at the top and maneuvered out of the oblong holes in the motor casing. Then I removed the two similar, but longer, clasps which held the motor onto a metal plate by a similar design. These longer clasps required removing a screw from the top of each clasp (which held the clasps onto the motor casing). After this, the motor required a bit of lifting to take off the plate but there were no other screws or attachments. With the motor set aside, I unscrewed the two bolts holding the plate against the agitator, and the broken coupling was easily removed. After that all I had to do was place the new coupling and put everything back the way I found it. I would recommend having some WD-40 for the new couplings because they have the reinforced metal in the center; it's nice and strong but it definitely made it a tighter fit especially with the agitator shaft. Overall it took me a while because I'd never done it before and I was figuring it out as I went. But for anyone with experience with tools or similar machines it wouldn't take very long I'd imagine. Repair time of the problem was easier than moving the washer out of a very tight laundry area. The repair was much easier than I anticipated. The parts fit perfectly , And it was successful. Washer would not agitate or spin. 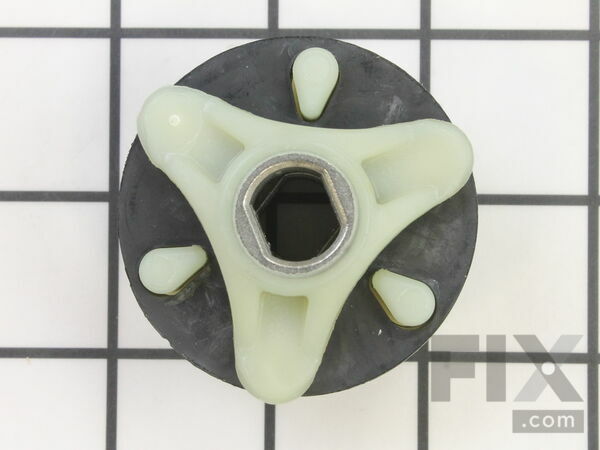 I followed the instruction video that was provided on the fix.com site for this part. The repair went just as the video described. No problems. Agitator would not agitate. Motor coupler needed to be replaced. I am 66 years old, less than 5 feet tall, and do not have the hand strength necessary to reassemble washing machine. The repair was not complicated - released the control panel and removed the washer cabinet. Removed pump and motor and the coupler was indeed broken. Removed damaged coupler and then attempted to reassemble the washer. It was too much for me to hold the motor and clamp it back into place. Fortunately, my daughter was there to help me and, together, we were able to hold the motor and clamp it into place. After that there was no problem and the machine is working beautifully. Washer was making a rubbing noise in all cycles. I watched the video for the direct drive motor coupling. I didn't remove the cabinet, I turned the washer on one side and worked from the bottom of the washer. I didn't remove the pump or hoses, I just removed the clips for the motor and moved it around so I could replace the part on the motor shaft and then replaced the other part on the drive shaft. I inserted the rubber part onto the drive unit and moved the motor around to get in back in place and replace the clips. I really appreciated the video and the fact that this part was available for a 22 year old washer. I decided to attempt to replace both the clutch and the drive coupling. I had to take apart the couple to do the clutch anyway. Unfortunately I was unable to remove the couple plastic/fiberglass pieces so I only replaced the rubber coupler. The transmission; however, was covered in clutch dust. I put the new one in, put it back together and notice my clear plastic drum was disgusting, so I tore it apart somewhat to clean it. Then put it all back together and it works like a champ. Awesome videos for instruction. Next time something fails I am shopping here first.